Tooth loss not only affects your smile, but your oral health as well. 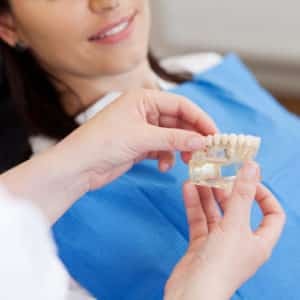 Missing teeth can make biting, chewing, and speaking more difficult, and your roots do more than hold your teeth in place, they provide nourishment to your jawbone. Maintaining your dental and oral health is best achieved by replacing lost teeth with the most lifelike prosthetic options, which include dental implants, the only dental treatment that provides a prosthetic root. Implants are small titanium posts inserted into the jawbone. The bone fuses with the post creating a stable, root-like structure. Once the jawbone is completely healed your dentist will secure a replacement dental crown, bridge, or denture to the implant post/s. The longer a tooth is missing, the more pronounced the effect on your oral health. In the case of a tooth extraction, we can drastically minimize these effects by placing a dental implant-supported restoration on the same day your tooth is extracted. Our on-staff periodontal specialist can place your implant post immediately after extraction so you can leave our office with your smile restored. Dental implants rely on a healthy jawbone for support. Therefore, patients who’ve lost all of their teeth on the upper or lower dental ridge may not have enough healthy jawbone structure to support several implants posts.With All-On-4® implant dentures, only four strategically placed implant posts are required to support a complete denture. All-On-4® implants are often ideal for patients who’ve worn dentures for a while, and have experienced jawbone deterioration due to missing roots.